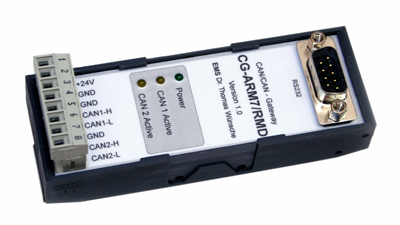 The rail mountable CG-ARM7 CAN Bus gateway connects and interfaces two CAN Bus subsystems or segments, allowing for the flexible design of wiring topologies, with star, tree and extensive line structures realizable. It supports data rate adaption, message filtering, and identifier conversion between the coupled busses, and is available either with two High Speed bus interfaces, or with one High Speed and one Low Speed bus interface. High speed processing and low latency allows use with high data rates and bus loads, and the restriction of the maximum data rate depending on cable length for single CAN segments can be abolished for an over-all system. Device configuration is conducted using a PC, via CAN if also using any of the CPC Series PC Interfaces - PCI Express, USB, or Ethernet are supported - or through the built-in RS232 interface. Download software for the configuration is available for Windows and Linux PCs.